SoCal's wonderful weather makes an ideal location for some of the largest animal sanctuaries in the nation. Many opportunities to get up close to both wild and companion animals are within Santa Clarita and Los Angeles County. We include map links with directions. Please note that while many of these rescues and sanctuaries do not charge an admission, most are run by volunteers with very little funding--if any. They all appreciate your donations, and many seek volunteers to love and work with the animals. Also, many are located at personal residences, so please call ahead as requested. Please visit our Calendar of Events for specific tour and 'up close' opportunities. Amazing fun for the whole family, and at an unbeatable price! Don't miss this rare opportunity for the experience of a lifetime--which you'll make a family tradition. Visit our Special Offers page for your discount from Newport Landing for your passport to great family fun! A non-profit organization providing hands-on learning experience, touch tanks, and daily activities. Suitable for small children. Limited hours. Chickens, horses, pigs and other barnyard animals (over 50!) await your visit at the barnyard zoo in William S. Hart Park. Admission is free. Open daily 9:00 am to 4:00 pm (close early on holidays). Get a virtual tour here. The best time to visit the barnyard is between 12:30-2:00 for afternoon feeding. The geese form a procession from the duck pond back to their enclosures for their meal. Pellets are available to purchase in a dispenser next to the chicken coop. (Bring your quarters!) Be sure to download a QR code reader to your smartphone for your self-guided tour through the barnyard. Is it the bison you want to see? Come in the morning between 9-10:00 right after they've been fed. Refurbished in 2013, this aviary is open to the public and a long-time favorite of locals. Some of the species you'll view: peacock, cockatoo, cockatiels, parakeets, parrots, peafowl, pigeons, doves, geese. Shaded picnic areas, updated bathrooms. Several bison roam the hillside near the William S. Hart Museum, donated by Disney in 1962. Park the car in the lot and walk up the drive toward the mansion. They can be difficult to spot; look for the chain link fence 'feeding area' to your right just before you reach the mansion. They are usually there every day between 6:30-noon, and then again at 4:00 pm for feeding. If it is blazing hot, they may be resting in the shade at the bottom of the hill near the Senior Center, or drinking from their watering trough. Or they could be roaming anywhere on the hillside around the mansion. Free. While there, stop in for a tour of the mansion, offered Wednesday--Sunday, hours vary. Free. Open to the public on Saturdays & Sundays from 11:00 am - 5:00 pm. Wildlife education shows and carnivore feeding demonstration at regularly scheduled times, free with admission. Up-close and personal opportunities also available. Also known as "The Cat House" this big cat rescue is just 40 minutes outside of Santa Clarita in Rosamond. Not only are kids always welcome and the admission nominal, but there are special events such as Twilight Tours and Kids Day! And they are always in need of volunteers. Technically an ape, these animals are smaller than a chimpanzee and do not have tails. 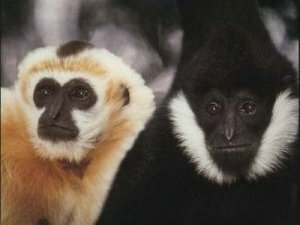 The forty gibbons at the Gibbon Conservation Center live as families in outdoor enclosures on the 2.5-acre site located across the street from Lombardi Ranch on Bouquet Canyon. The gibbons will entertain you with their beautifully pitched voices and acrobatic antics. Call ahead and join a scheduled tour, or reserve a private tour. Tours are also open to the public on Saturdays and Sundays. The center is always looking for volunteers, age 18 and over. Admission is tax deductible. Shambala Preserve, an 80-acre wildlife habitat, is a haven for endangered and exotic big cats. African lions, Siberian and Bengal tigers, leopards, servals, mountain lions, bobcats, a lynx, a Florida panther, a snow leopard, and a cheetah all reside at this sanctuary--the only one like it in the United States. Open periodically for public tours to visitors 18 and over. Open year 'round on Saturdays and Sundays. Guided one-hour tours are held 11am, 1pm, and 3pm. Always call ahead to avoid disappointment. Reservations are not required, but to visit with the animals you do need to join a guided tour. This animal rescue shelter opens its doors to the public Sundays from 10:00 am - 2:00 pm. Teaching kindness and compassion to animals, you'll have an opportunity to not only interact with the pigs, but to brush the horses, hug the cows, hold the chickens, hang out with a turkey, and pet the goats and sheep. The passion of this sanctuary is to save ponies, horses and donkeys. They also have rescued other abused animals. All of the animals here are not suitable for adoption. The public is welcome to visit by appointment. Location will be provided when you call. Get up close and personal with some of the scariest insects and reptiles from our area. Saturdays at 1:00 PM the Placerita Nature Center staff bring out these creatures to give you an opportunity to touch them. The Interpretive Center's grand opening was February 2015 and features animal enclosures, an observation deck with two telescopes to observe nearby wildlife, a classroom, gift shop, and patio. It is open Tuesday - Sunday, closed on Mondays, 9-5. Free. Home to a pack of ten Alaskan wolves, the foundation seeks to educate children of all ages about the wolves' contribution to the environment. Meet and play with the wolves! Reservations are required to join a Saturday tour.